The Experience Essence™ document captures the elements that convey meaning in the experience that you are envisioning. It inspires and aligns all design efforts. Storytelling is a critical aspect of an immersive experience. 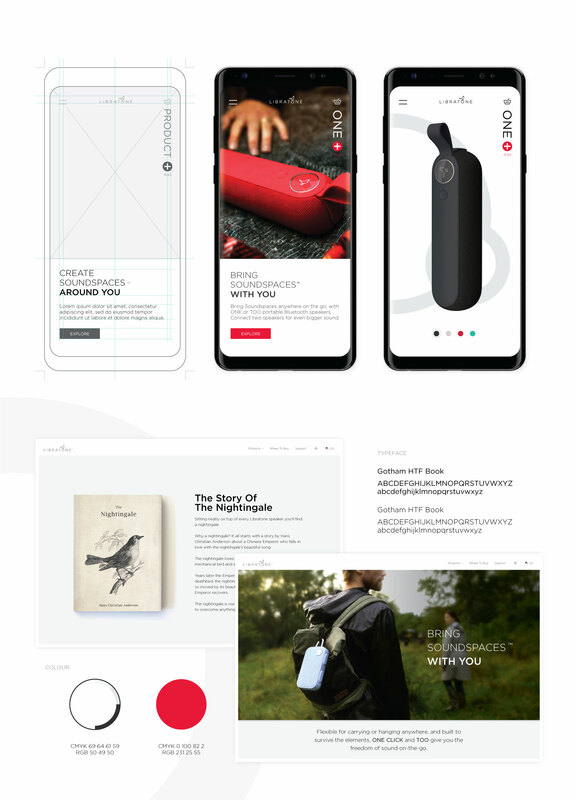 Our wireframes compellingly showcase the structure, interactions and narrative arc of the envisioned experience. We bring your website to life with compelling visuals, iconography, animations and interaction details that are intuitive, inspiring and frictionless. 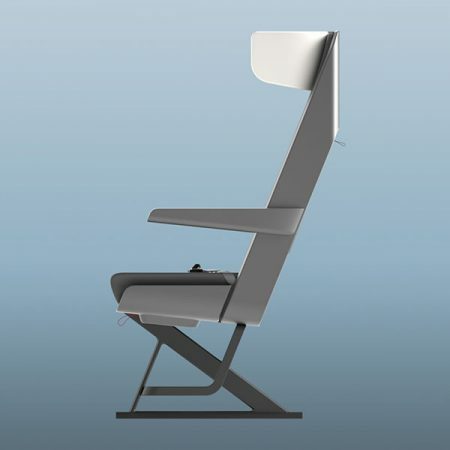 We work with the development team to ensure that the design stays true through final execution. By staying consistent all the way through the brand experience and bringing it to life in tangible ways, our designs have meaningful impact that build your brand and your bottom-line. 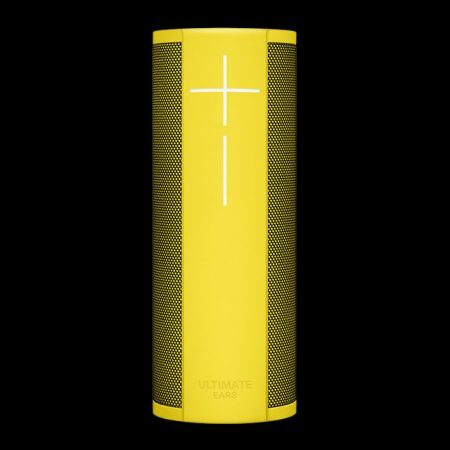 Libratone is a Danish brand known for its beautifully designed audio products. Relatively new on the American market, the company knew it was important to convey its story equally well. 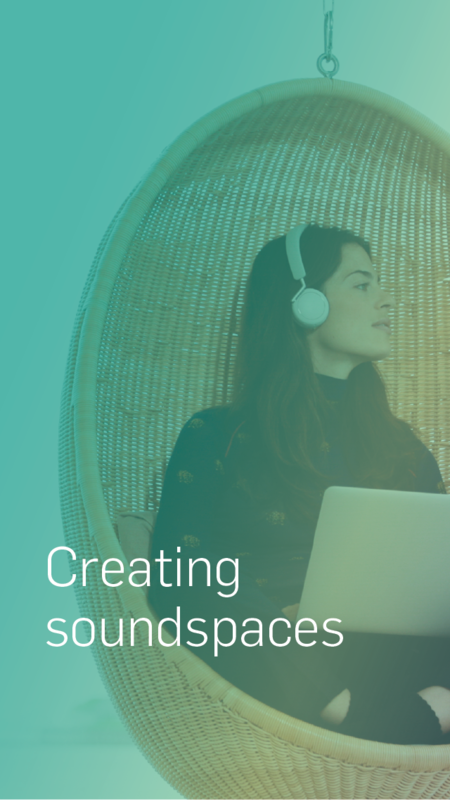 The seed for the storytelling came from a product feature unveiled by the company a few years earlier, SoundSpace Link. The trademarked term Soundspaces™, a true diamond in the rough, was not used beyond this context. We all instinctively use sound and music to carve out spaces, whether to bring more vibrancy or calm, whether together with others or just for ourselves. 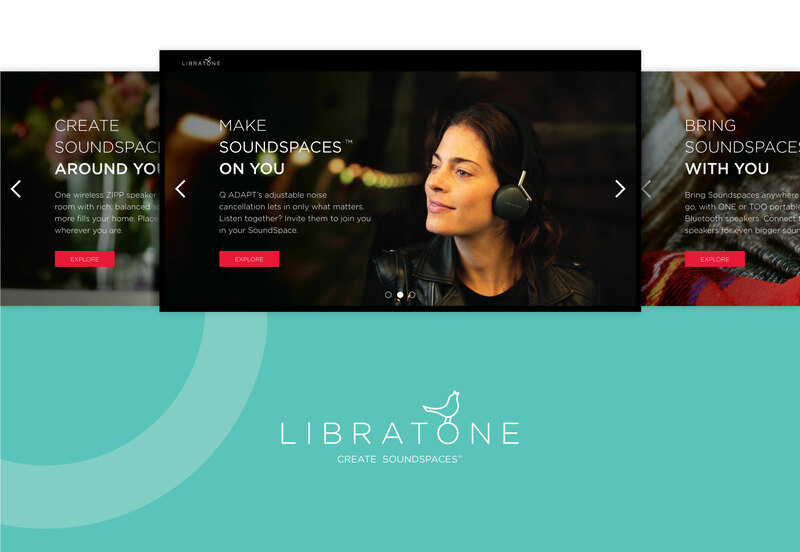 Creating soundspaces formed the basis for a narrative structure that directed the storytelling from the digital to the physical, from the website to the first Libratone store in the United States. 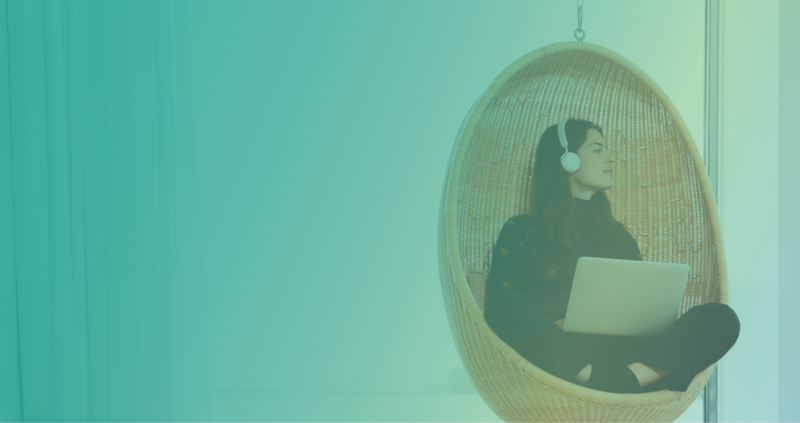 The product portfolio, which previously was shown on the website as a line-up of every single product – overwhelming if you weren’t already familiar with the product line – was now simplified in three simple groupings; soundspaces around you, on you and with you. 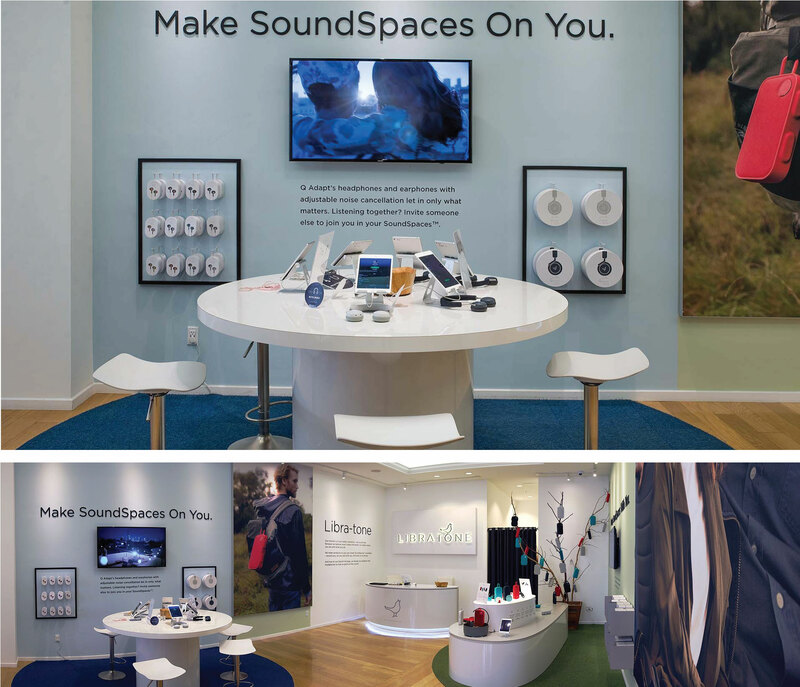 The first Libratone store to open in the United States was an opportunity to let customers experience soundspaces first hand. 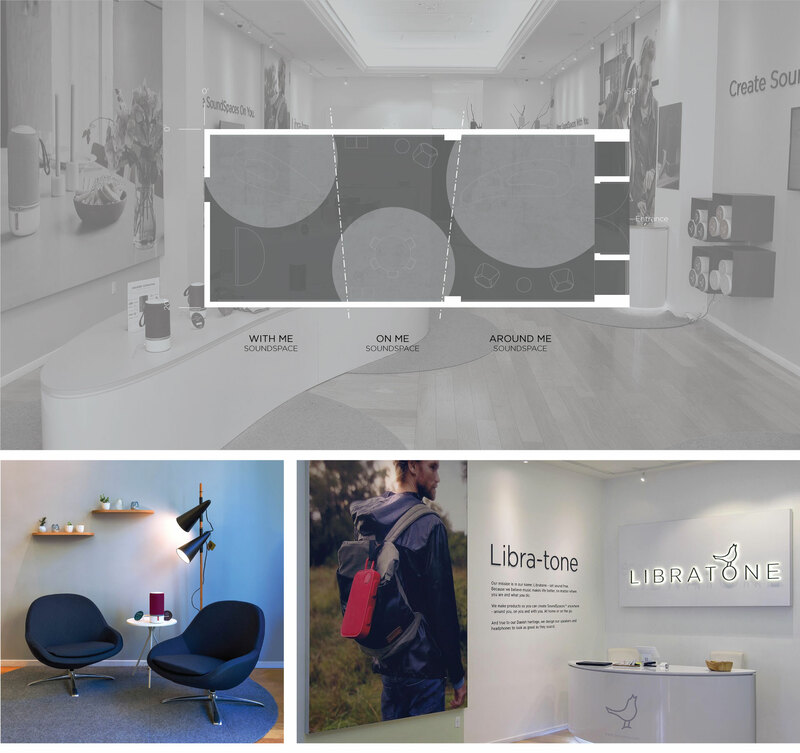 The deep, rectangular space, with details that betrayed its previous use as clothing store, was quickly transformed into a flagship Libratone store. Softening the rectangular space are rounded shapes that delineate the store experience into soundspaces. Upon entering the store the customer immerses into the first soundspace, around you, where it is impossible to pinpoint where the music is coming from. The colorful ZIPP speakers can be experienced hands-on, whether on softly curved POS displays or from the comfort of lounge chairs reminiscent of a home environment. Proceeding further into the store reveals a round table, where it’s easy to pull up a bar stool to try the experience of soundspaces on you with the Q ADAPT headphones and earphones. Seated at the table, surrounded by the conversations of other customers and the music from the ZIPP speakers, customers can get an immediate sense of creating a soundspace on them, through the adjustable noise cancellation of the Q ADAPT earphones and headphones. In the corner beyond the table, another curved display beckons you to bring soundspaces with you, with ultra-portable Bluetooth speakers.